Kevin Klehr came to visit us on WROTE recently! To listen to his episode and find links to his work, check out Episode 163: A Good Femme Fatale! Considering how relevant the role social media plays in our lives, I’m surprised I haven’t come across a book that deals with the phenomenon before now. 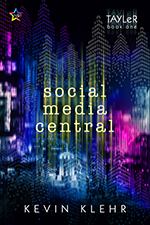 Social Media Central deals with one lonely man who doesn’t buy into the whole world-wide obsession and god-like status of media celebrities, but he gradually gets sucked into it after meeting Madeline Q, a fashion blogger, and her glamorous colleagues. The story is set fifty or so years in the future but frankly, we’re seeing elements of Klehr’s vision now. Klehr’s future world has no books, empty offices, most ordinary people shut in their own rooms to work, preferring to “mirror meal” (a chilling phrase if ever there was one) with friends instead of meeting them face to face. The exceptions were the glamorous ones, the media stars, the celebrities famous for being famous, who set the trends and tell people how to eat, what to wear etc. Again, not that different from now in many aspects. Tayler is a lonely geek with a dim view of the whole on-line celebrity thing. I found it difficult to get to know him at first. There was a dispassionate tone to the dialogue which meant I didn’t feel I had full access to the Social Media world, but was looking at it through smeared triple-glazing. Having said that, Tayler was the easiest character to identify and sympathise with. I couldn’t get to the heart of who Madeline was, which was frustrating. As the story progresses, the plot thickens when a girl’s body is found in a nightclub. No spoilers, but what follows is a lot of smoke and mirrors, some of which I didn’t get at all. Madeline isn’t who she seems, and her actions seem incomprehensible at first. The pace of the story was uneven in places, but I did find myself compelled to read to the end. Before that, I did struggle a bit, mainly because the characters (apart from Tayler) aren’t people I would choose to spend time with in real life. I’ve since read some parts of the book again, and have enjoyed it a lot more, although “enjoyed” might not be the right word. The world of Social Media Central is bleak, very well-crafted, and ultimately rather depressing, but with a whodunnit thrown in, and a dash of glamour, it does make for a compelling read, and I had definitely warmed towards the characters by the end. One final note: A couple of reviews mentioned the “lack of LGBT content.” I disagree. The characters were diverse and fluid, without a lot of rainbow flag waving. It was subtly done, and a worthy addition to the mainstream as well as LGBT+ sci-fi genres. In an age where everyone lives their lives through a screen, no one has more celebrity status than fashion blogger, Madeline Q. In a chance meeting, Tayler, loner and geek, is introduced to her world of parties, fan worship, and seduction. But as his own star rises, Madeline Q is arrested for murder. There’s just one problem—there is no corpse. Tayler soon learns that fiction blurs reality on Social Media Central. It gives us great pleasure to welcome Lindsay Pierce as the guest on Episode 141: Resiliency! This week Lindsay Pierce joins us to talk about her breakout novel, Trans Liberty Riot Brigade, the dystopian themes we’re seeing come to life, the nature of Y/A, and the importance of resiliency! The words “Hey, but what if…?” are music to Lindsay’s ears. She is a graduate from The Evergreen State College and bathes in the sweet liberal waters of the Puget Sound. Or she would, if it wasn’t so polluted. She is a lover of the new and the old, of asking questions and contemplating possibilities. Lindsay’s work is primarily speculative fiction and she is an unapologetic Nerd. She lives with her husband and four fur-babies in Olympia, Washington.